Product prices and availability are accurate as of 2019-04-18 02:37:31 UTC and are subject to change. Any price and availability information displayed on http://www.amazon.com/ at the time of purchase will apply to the purchase of this product. The Chicken Soup for the Soul: Loving Our Dogs: Heartwarming and Humorous Stories about our Companions and Best Friends contains wonderful stories about our canine companions that will leave you laughing, crying and everything in-between. We hope this book becomes one of your personal favorites! 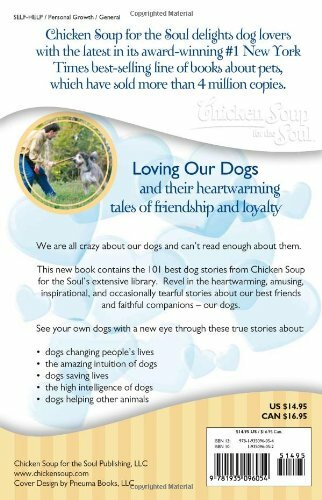 This book from Chicken Soup for the Soul contains the 101 best dog stories from the company's extensive library. We are all crazy about our dogs and can't read enough about them. 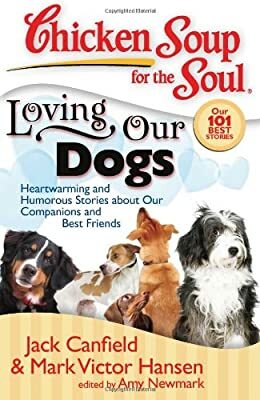 Readers will revel in this collection of heartwarming, amusing, inspirational, and occasionally tearful stories about our best friends and faithful companions - our dogs. These true stories will make you appreciate your own dogs and see them with a new eye. Some of these stories describe amazing contributions made by dogs and highlight their intelligence and intuitive abilities. Many will make you laugh or cry. They will all renew your admiration for your canine companions. The first Chicken Soup for the Soul book was published in 1993, and became a publishing industry sensation, ultimately selling eight million copies. The company went on to publish more than 150 Chicken Soup titles, selling more than 100 million copies, and becoming a household name.